If the scripts weren't bad enough, sadly, Peter Capaldi cannot get a break for his first series. A rough, cut down and restricted copy of the first episode has now found its way onto the internet. Like the scripts, this copy was also taken from BBC Miami's site and are designed for translating and dubbing by Drei Marc, however it was presumed that since it didn't turn up shortly after the scripts, BBC Miami acted in time to prevent it. How wrong we were. Only the first episode has come out. The length stands at 1:15:57, which may still be subject to change. 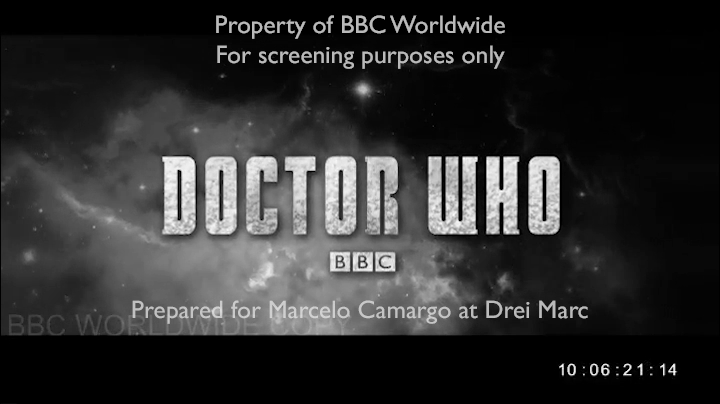 The copy of the episode is black and white, cropped at the top and bottom to form a letterbox with limited CGI and is massively watermarked. Matt's old title sequence has been used, just like previous new title sequence episodes have used the previous title sequences before transmission. Update: A BBC spokesperson told RadioTimes.com: "This is part of BBC Worldwide's ongoing security investigation into leaked unfinished Doctor Who materials. This content is currently being removed and originates from the same Miami server disabled last week, it is not a new issue. We'd like to thank the amazing Doctor Who fans who are continuing to keep fansites and social media spoiler-free." Steven Moffat has spoken out against the script leaks earlier today at London Film and Comic Con, stating that it is "horrible", "miserable" and "upsetting" and is grateful for those who haven't spread spoiler or read the scripts; "We’re miserable about it. They were stolen. It’s theft". As before, we won't be linking to it, nor will we be revealing spoilers from it. Please can our users keep our site link/hint free and be careful on the internet. The comments are still set to pre-moderation. We urge fans not to watch it, but rather wait until airing where you can see it how it was designed to be. Failing that, we urge fans to at least be aware of fake copies. Nice to know you won’t be doing spoilers from the episode … ! Sadly I can't post the link to it because the link IS the video. I was told that it was up, so I went to look for it. There isn't a page where it is detailed or talked about. There's just where it can be obtained from with a title. I downloaded it, watched it a bit to verify it, then posted about it. What size is the file, just so I know if I find the real one or not? I admit to watching it. I'll just say I was very pleased with the story and can't wait to see it when it airs in full color and without a bunch of crap written all over it. I can't tell whether it's identical with the scripts, for I will neither read them before the official broadcast, nor watch the dubbing version until then. But judging by the size of the file and by what I've heard from people who apparently watched it (and read the scripts) it appears to be "the real thing", yes. Since I realise that many people will be on the lookout for this episode (be it because they REALLY want to see it, or because they want to help the BBC remove it... or because they, like me, intend to watch it after they've watched the official broadcast), here's just as much of a hint as I believe I can give you: if you search for the right keywords on the right hosting sites, it's not hard to find download links. Just please: don't spoil it for anyone else, alright? I wouldn't want to lay my eyes on this right now, but I wish I could see this version after the actual episode airs so as to compare both versions. It should be funny to see the episode with minimal CGI! The second episode has leaked also, in the same format. Only solution is to debut the show sooner. I agree this is theft. But when you leave a diamond necklace on the seat of your car without locking the doors you are not totally without responsibility. What a mess. I watched it and I think I was better able to appreciate it without all the OTT CGI and the overwhelming bloody Murray Gold twatpomp swamping the sound mix (I really detest Murray Gold). The atmos around the new doc occasionally reminded me of "The Stranger", those early 90's straight-to-video Doctor Who spinoffs starring Colin Baker. But that's all you're going to get out of me!